Casita de Madera pretende mejorar su Infraestructura e instalaciones para albergar a más niños y poder brindar una mejor educación en el nivel inicial y Primaria, para lo cual ha realizado un proyecto de construcción que espera se pueda concretar gracias al apoyo de todas las personas que quieren seguir apoyando como lo ha venido haciendo. Gracias a su generoso apoyo pudimos llegar a ayudar a mas de 200 familias afectadas por las lluvias , inundaciones y Huaycos que dejaron en la total destruccion miles de hogares peruanos. Llegamos hasta el centro centro poblado San Jacinto ubicado a 45 minutos de el Puerto de Chimbote, llevandoles viveres articulos de aseo frazadas y contenedores para que puedan almacenar agua tan necesario en estos tiempos. Les hicimos pasar una tarde divertida a los mas pequeños con un hermoso show infantil. Pensando En Ellos has been working with Rasa Joven since late 2010, this project is called "Casita de Madera" Casita de Madera is located in the District of Huanchaco in Trujillo, Peru. There are approximately 80 preschool age children who lack and are in desperate need of education resources. 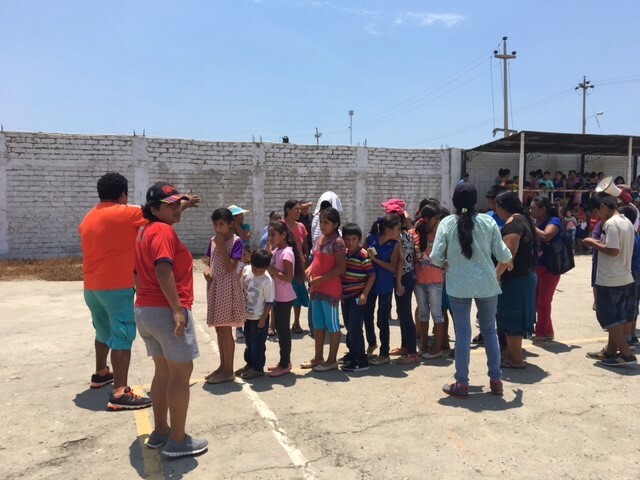 The District of Huanchaco currently does not have an early childhood education center and does not receive support from public or private entities. Rasa Joven provides basic service readiness, education and health care resources, and feeds children ranging in ages 1 to 5. RASA Joven is committed to improving conditions in the area for the youth and families who are less fortunate and are in dire need of assistance. Due to the current conditions and overwhelming demand, RASA Joven's intent is to remain in the District of Huanchaco long term. While partnered up with RASA Joven, Pensando En Ellos has aided with school supplies including but not limited to pens, pencils, reading books, crayons, glue, erasers, puzzels, binders, back packs. Pensando En Ellos has also provided class room furniture, toys, and clothing. Donations are made yearly in January which are typically delivered by a minimum of one representative from Pensando En Ellos. Interesting enough, we as a foundation raise the bar yearly because of the amount of work and the vision of one day providing a safe, clean, and constructive place for the children to learn and develop. Some of the miles stones accomplished to date are: purchased a house made of wood (Casita De Madera) to accommodate more children, supplied cribs for infants, fenced in the property to keep vandals out, and provided additional school supplies. Working to improve the playground on site which has an existing slide made of concrete. Donate 100 pairs of shoes. Level the ground and lay grass. Install a multifunction water pump 15 feet underground to water the grass and possibly make water available to surrounding neighbors, and build a storage room to house valuables and serve as a dining room.